A large number of chemokines, cytokines, and signal peptides share a highly conserved X-Pro motif on the N-terminus. The cleavage of this N-terminal X-Pro dipeptide results in functional alterations of chemokines such as RANTES, stroma-derived factor-1, and macrophage-derived chemokine. Until recently, CD26/DPPIV was the only known protease with the ability to cleave N-terminal X-Pro motifs at neutral pH. We have isolated and cloned a novel serine protease, quiescent cell proline dipeptidase (QPP), with substrate specificity similar to that of CD26/DPPIV. In this paper we show that QPP, like CD26/DPPIV, is synthesized with a propeptide and undergoes N-glycosylation. Interestingly, this glycosylation is required for QPP enzymatic activity, but not for its localization. Unlike the cell surface molecule, CD26/DPPIV, QPP is targeted to intracellular vesicles that are distinct from lysosomes. Proteinase K treatment of intact vesicles indicates that QPP is located within the vesicles. These vesicles appear to have a secretory component, as QPP is secreted in a functionally active form in response to calcium release. The presence of QPP in the vesicular compartment suggests that molecules bearing the N-terminal X-Pro motif can be cleaved at multiple sites within and outside the cell. These results expand the potential site(s) and scope of a process that appears to be an important mechanism of post-translational regulation. Proteolytic cleavage of proteins can have profound effects on their stability and function (1, 2, 3). There is a striking conservation of X-Pro motifs on the N termini of many chemokines, cytokines, and other signal peptides, suggesting a selective pressure for this motif in the evolution of these molecules (4). For many of these factors, the significance of the X-Pro motif has yet to be ascertained. Recently, however, the work of several groups has shown that the N-terminal X-Pro motif of the chemokines RANTES, stroma-derived factor-1α (SDF1α),3 SDF1β, eotaxin, and macrophage-derived chemokine (MDC) is cleaved by dipeptidyl peptidase IV (DPPIV/CD26), resulting in an alteration of their biological function (2, 3, 5, 6). Thus, it appears that the N-terminal X-Pro motif on signal molecules may serve as a site for post-translational modification and regulation. The cleavage of proline-containing peptide bonds on the C terminus can also affect the function of molecules. Angiotensin, for example, undergoes a loss of vasoactive function following post-proline cleavage of the C-terminal amino acid by prolylcarboxypeptidase (PCP; angiotensinase C) (7, 8). Few proteolytic enzymes that cleave peptide bonds containing proline have been identified. These include exopeptidases such as CD26/DPPIV and PCP (4). We have isolated and cloned a serine protease, quiescent cell proline dipeptidase (QPP), which has substrate specificity very similar to that of CD26/DPPIV (9). Both these enzymes cleave N-terminal dipeptides when the penultimate amino acid is a proline or, less preferably, an alanine residue (9, 10, 11). Recently, we observed that highly specific aminodipeptidase inhibitors cause cell death in quiescent lymphocytes, but not in activated lymphocytes (12). QPP is the likely target of these inhibitors, suggesting that this protease plays an important role in resting cells (12). However, unlike CD26/DPPIV, which is found on the cell surface (10, 11), QPP was isolated from intracellular fractions (9). Although QPP and CD26/DPPIV share substrate specificity, there is no significant sequence homology between these two proteases, suggesting an evolutionary convergence of functional activity. QPP does, however, share significant sequence homology with the lysosomal serine protease PCP (42% sequence identity) (7, 9). It is interesting to note that the three post-proline-cleaving proteases, CD26/DPPIV, PCP, and QPP, all have the same sequential ordering of the active site residues, Ser-Asp-His (4, 9), and are functionally active as homodimers (7, 9, 11). In this work we show that similar to its functional homologue, CD26/DPPIV, QPP is synthesized with a cleaved pro-peptide. QPP undergoes N-linked glycosylation at the Golgi apparatus, which is required for its proteolytic activity. Unlike CD26/DPPIV, QPP localizes to a post-Golgi vesicular compartment. QPP-containing vesicles have similar density to lysosomes, but further fractionation shows that QPP-containing vesicles form a distinct compartment, and unlike mannose-6-phosphate (M6P)-dependent lysosomal targeting (13), QPP localizes to vesicles by a M6P-independent mechanism. QPP is localized in the vesicular lumen, as it is not susceptible to proteinase K digestion of intact vesicles. Functionally active QPP can also be detected in cell culture supernatant, and its secretion can be induced by cell activation and calcium mobilization, suggesting that there is a secretory component to the QPP-containing vesicular compartment. The study of post-translational modification of N-terminal X-Pro-containing signal molecules has been a rapidly expanding field in the last few years. The discovery of a novel post-proline-cleaving aminodipeptidase in a distinct compartment from CD26/DPPIV broadens the scope of post-proline-cleavage as a regulatory mechanism. Anti-Myc Ab was purchased from PharMingen (San Diego, CA), and anti-hemagglutinin (anti-HA) Ab was purchased from BabCo (Berkeley, CA). The anti-lysosome-associated membrane protein-1 (anti-LAMP1) mAb H4A3 was obtained from the Developmental Studies Hybridoma Bank (Iowa City, IA), and the anti-calnexin mAb was purchased from StressGen (Victoria, Canada). Rab11 and adaptin-α Abs were purchased from Transduction Laboratories (Lexington, KY). The reporter substrates alanine-proline-aminofluorocoumarin (Ala-Pro-AFC) and z-glycine-glycine-leucine-aminomethylcoumarin (zGGL-AMC) were purchased from Enzyme Systems Products (Dublin, CA). Tunicamycin, ionomycin, and cyclohexamide were purchased form Sigma (St. Louis, MO), and peptide-N-glycosidase F (PNGase F) was purchased from New England Biolabs (Beverly, MA). To make the QPP-green fluorescent protein (GFP) construct, enhanced GFP was amplified from the cloning vector pEGFP-N1, obtained form Clontech (Palo Alto, CA), and cloned into the pCI-neo expression vector from Promega (Madison, WI). The sense primer incorporated five glycine codons upstream of GFP. 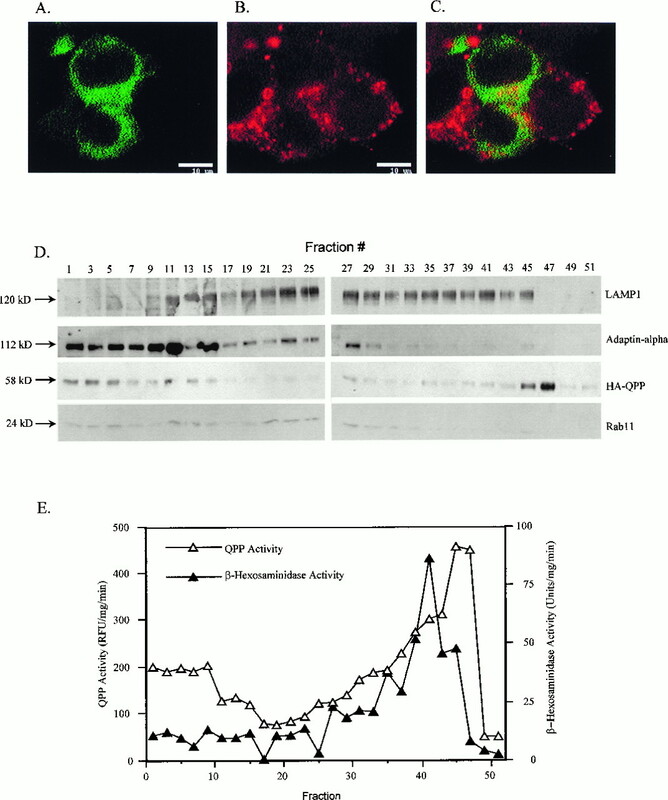 QPP was amplified with primers containing restriction site linkers and cloned in frame upstream of enhanced GFP. The QPP-Myc fusion was generated by PCR using the high fidelity DeepVent polymerase (New England Biolabs), with an antisense primer that coded for 10 aa comprising the c-Myc epitope tag (EQLLISEEDL). Likewise, a QPP-HA fusion was generated using an antisense primer that coded for 10 aa comprising the HA epitope tag (YPYDVPDYA). All constructs were cloned into the pCI-neo expression vector. Transfections were performed using the calcium phosphate method. Cells (1–2 × 107) were resuspended in lysis buffer (20 mM HEPES, 1.5 mM MgCl2, 2 mM EDTA, 10 mM KCl, 0.1% Nonidet P-40, 5 μg/ml antipain, and 5 μg/ml leupeptin) for 30 min at 4°C. Lysed cells were centrifuged at 3,000 rpm on a microcentrifuge for 10 min, and the pellet was discarded. The postnuclear supernatant was subjected to a 30,000 × g centrifugation for 30 min. The protein concentration was measured using the bicinchoninic acid protein estimation kit (Pierce, IL). For the immunoblot assay of supernatants, the supernatants of QPP-transfected or vector-transfected (control) cells were centrifuged at 300 × g to remove all cells and subjected to SDS-PAGE analysis. QPP and proteasome enzymatic activities were measured using the fluorogenic substrates Ala-Pro-AFC (20 μM in 50 mM HEPES buffer) and zGGL-AMC (100 μM in 50 mM HEPES), respectively, on a Fluoromax fluorescence plate reader (Molecular Devices, Menlo Park, CA; AFC: excitation 390 nm; emission 510 nm; AMC: excitation, 460 nm; emission, 510 nm). For the β-hexosaminidase assay, the fluorogenic substrate used was 4-methylumbelliferyl-β-d-glucosaminide. Twenty microliters of the samples obtained from the discontinuous gradient were incubated with 0.5 ml of the substrate solution (1 mM 4-methylumbelliferyl-β-d-glucosaminide and 0.1 M sodium acetate, pH 4.5) for 5 min. For the continuous gradient fractions, 10 μl of the samples were incubated for 20 min. The reaction was stopped with 1.25 ml of stop solution (0.5 M glycine and 0.5 M Na2CO3). The samples were read using an excitation wavelength of 364 nm and an emission wavelength of 448 nm. Fifty micrograms of lysate from control or QPP-transfected cells was boiled for 10 min under denaturing conditions (0.5% SDS and 1% 2-ME). Following this the samples were brought up to 1% Nonidet P-40 and 0.05 M sodium phosphate. PNGase F (500 U) was added and incubated for the indicated times at 37°C. The reaction was terminated by boiling the sample in 2× reducing loading buffer for 5 min, followed by SDS-PAGE and immunoblot analysis. The controls were treated in the same manner except for the addition of PNGase F.
293T human fibroblasts were transfected with QPP-GFP or QPP-Myc, plated on coverslips, pretreated with fibronectin (100 μg/ml), and blocked with 1% BSA in PBS. These cells were fixed in 4% paraformaldehyde and permeabilized with 0.1% Triton X in PBS. The primary Ab was incubated for 1 h at 4°C, followed by three washes and incubation of the secondary Ab, where applicable, for 1 h at 4°C. The samples were washed and visualized by confocal microscopy. The isolation of subcellular organelles on discontinuous density gradients was performed as previously described (14). In addition, a continuous gradient fractionation was performed. Briefly, 1 × 108 cells were lysed by cavitation or Dounce homogenization (Kontes, Vineland, NJ) in 0.25 M sucrose, and the postnuclear supernatant (PNS) was taken from a low speed centrifugation. For discontinuous fractionation, a metrizamide/Percoll (Accurate Chemical & Scientific Corp., Westbury, NY) gradient was set up, using 35% metrizamide, 17% metrizamide, and 6% Percoll, and the PNS was layered over it. Following ultracentrifugation at 60,000 × g the four interface layers were harvested and analyzed. The orientation of the gradient is as follows: lightest fraction = fraction I, most dense fraction = fraction IV. For the continuous gradient fine fractionation of subcellular organelles, a metrizamide/Percoll gradient was set up as follows: 1 ml of 35% metrizamide was placed on the bottom of the tube, followed by a linear gradient of 5–20% metrizamide, 1 ml of 6% Percoll (Pharmacia, Uppsala, Sweden), and 2.5 ml of PNS. The gradients were centrifuged at 160,000 × g for 2 h at 4°C, using a SW41 swinging rotor (Beckman, Fullerton, CA). Gradients were fractionated in 250-μl aliquots. These fractions were analyzed as described. The QPP-containing vesicular fraction was obtained by discontinuous gradient fractionation and either were left untreated or were treated with proteinase K. Fractions were incubated in chymostatin (30 μM) for 10 min on ice. These vesicles either were left unpermeabilized or were permeabilized with 1% Triton X. Proteinase K (10 μg/ml) and CaCl2 (1 mM) were added to the samples for 20 min at 0°C. The reaction was terminated by the addition of AEBSF (100 μM). QPP was purified from Jurkat cells as previously described (9). Briefly, Jurkat S-110 supernatant was dialyzed against 4 l of 50 mM acetic acid, titrated to pH 4.5 with NaOH. The protein sample was clarified by centrifugation at 1000 × g for 10 min at 4°C. The clarified supernatant was concentrated on a Centricon 50 membrane to about 10 ml. The concentrated sample was loaded onto a 3 ml of HiTrap SP Sepharose column and equilibrated with 50 mM acetate, pH 4.5 (start buffer). The column was washed with 10 column volumes of start buffer and eluted with a linear 0–300 mM NaCl gradient in start buffer. Active fractions were pooled and concentrated to about 1 ml on a Centricon 50 membrane, then to about 0.2 ml on a Microcon 30 membrane. The concentrated material was loaded onto a Superose 12 gel filtration column and equilibrated with 50 mM acetate, pH 4.5, and 150 mM NaCl. Active fractions were pooled and used as a purified preparation of the activity. QPP was initially purified from the cytoplasmic fraction of Jurkat T cells (9). To determine the cellular localization of QPP, confocal microscopy was performed on cells expressing a QPP-GFP fusion protein. 293T human fibroblasts transfected with this chimeric construct showed a cytoplasmic distribution (Fig. 1⇓A). Unlike CD26/DPPIV, QPP does not localize to the cell membrane. This was confirmed by biochemical means; namely, surface biotinylation of QPP expressing cells, followed by immunoprecipitation, did not yield any biotinylated QPP molecules (M. Chiravuri et al., unpublished observations). To ensure that the distribution of QPP-GFP was not altered by the presence of the GFP portion of the construct, immunohistochemical analysis was performed with a QPP-Myc construct (Fig. 1⇓B). Fig. 1⇓C shows that QPP-GFP and QPP-Myc colocalize, demonstrating that the nature of the tag did not affect QPP localization. Localization of QPP by confocal microscopy in 293T human fibroblasts and N-terminal sequencing of mature QPP. Human 293T human fibroblasts were transfected with a QPP-GFP (green; A) and a QPP-Myc (red; B) construct. These cells were permeabilized and analyzed with an anti-Myc Ab. C, Merged computer images, where colocalization registers as yellow/orange. D, QPP is synthesized with a propeptide that is cleaved. Purified QPP was subjected to N-terminal sequencing, and this sequence was compared with the full-length sequence of QPP. Proteins are routed to the secretory pathway by signal peptides that insert the protein into the endoplasmic reticulum (ER) membrane. Primary sequence analysis of QPP using a Kyte and Doolittle hydrophobicity plot (15) indicates a hydrophobic sequence in the N-terminus of QPP, aa 1–21. To verify this, QPP was purified from Jurkat cells and subjected to N-terminal sequencing. Fig. 1⇑D shows a comparison of the amino acid sequence of full-length QPP deduced from its cDNA (9) and the N-terminal sequence of mature QPP purified from Jurkat cells. It can be seen that a 29-aa peptide is cleaved from newly synthesized QPP. The cleaved sequence may be either a signal peptide alone or may include a signal peptide and a short propeptide. SDS-PAGE analysis shows that QPP migrates as a 58-kDa species, even though the predicted m.w. of QPP based on its primary sequence is 53 kDa. Similar to the lysosomal protease PCP (7), QPP has six potential N-glycosylation sites, and glycosylation at these sites could cause the observed increased in molecular mass. Tunicamycin is an inhibitor of N-acetylglucosamine (GlcNAc) transferase that blocks assembly of the GlcNAc-dolichol complex and thus prevents glycosylation of asparagine residues (16). QPP-transfected fibroblasts were treated with tunicamycin (5 μg/ml) for various periods of time. Fig. 2⇓A shows that the upper 58-kDa band gradually disappeared with increased time of tunicamycin treatment. We also treated QPP with PNGase F, an enzyme that cleaves between the innermost GlcNAc and asparagine residues of high mannose, hybrid and complex carbohydrates from N-linked glycoproteins (17). PNGase F treatment also caused the disappearance of the 58-kDa band (Fig. 2⇓B). These results indicate that the 58-kDa band represents a processed glycosylated form of QPP, while the 53-kDa band is the unprocessed form. QPP is N-glycosylated, and N-glycosylation is required for QPP enzymatic activity. Immunoblot analysis was performed with anti-Myc Ab. A, QPP-Myc (transfected) fibroblasts treated with tunicamycin (5 μg/ml) for the indicated times. B, Anti-Myc Western blot of QPP-Myc, either untreated or treated with PNGase F. C, QPP-Myc fibroblasts treated with cyclohexamide (15 μg/ml) for the indicated times. D, Analysis of QPP enzymatic activity (▪) and proteasome activity (□) in cells treated with tunicamycin for the indicated times. To further confirm this post-translational modification, we analyzed the effect of blocking new protein synthesis with cyclohexamide. Cells were transfected with QPP and treated for varying lengths of time with cyclohexamide. As shown in Fig. 2⇑C, following the inhibition of new protein synthesis, the ratio of the 53-kDa form of QPP to the 58-kDa form decreases. These results indicate that the 58-kDa species is the mature molecule. To determine the functional significance of the glycosylation, we analyzed the effect of glycosylation on QPP enzyme activity. Cells transfected with QPP were treated with tunicamycin for various time periods, and the ability of QPP to cleave the reporter substrate Ala-Pro-AFC was measured. QPP activity was significantly decreased following tunicamycin treatment, indicating that the 58-kDa species is the active form of QPP, while the unglycosylated form lacks QPP activity (Fig. 2⇑D). On the other hand, tunicamycin treatment did not alter the localization of QPP (see Fig. 6⇓ below). As a control, the cleaving activity of the proteasome was measured in each of the samples. The proteasome is a cytosolic molecular complex (18) that does not undergo a significant decrease in enzyme activity following tunicamycin treatment. Consistent with this, no change in proteasome activity was seen in the tunicamycin-treated samples. To localize QPP we performed biochemical organelle fractionation using both discontinuous and continuous metrizamide/Percoll density gradients. This was conducted on human fibroblasts transfected with a QPP-Myc construct as well as on untransfected Jurkat T cells. The transfected fibroblasts had identical phenotype and growth characteristics as untransfected cells. QPP-Myc fibroblasts were lysed by cavitation, and these lysates were fractionated. Four fractions were obtained from the discontinuous gradients and were analyzed using organelle-specific markers. As a cytosolic marker we measured the chymotrypsin activity of the proteasome complex, using the reporter substrate zGGL-AMC (19, 20). The lysosomal marker used was β-hexosaminidase activity (14), while LAMP1 was used as a marker for late endosomes and lysosomes (21). The ER marker used was calnexin (22), while the trans-Golgi network (TGN) marker was Rab11 (23). To detect QPP we performed Western blot analysis and measured its activity with the QPP reporter substrate Ala-Pro-AFC. The analysis of the four fractions is shown in Fig. 3⇓. The least dense fraction (I; soluble) had the most proteasome activity (Fig. 3⇓A), but contained very little QPP (Fig. 3⇓, F and G). Fractions enriched in Rab11 (II; Fig. 3⇓B) and calnexin (IV; Fig. 3⇓C) also showed little QPP activity (Fig. 3⇓F). Lysosomes and late endosomes were identified in fraction III by the presence of LAMP1 (Fig. 3⇓D), and this fraction also had maximal activity of lysosomal β-hexosaminidase activity (Fig. 3⇓E). 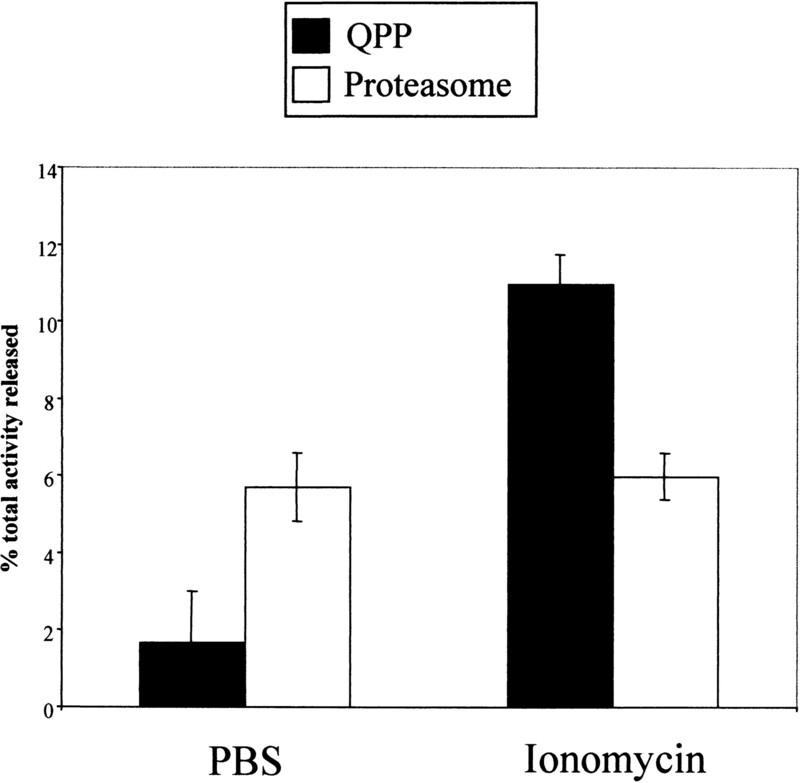 The fraction containing lysosomes (III) had the majority of QPP enzymatic activity (Fig. 3⇓F). This was confirmed using Western blot analysis (Fig. 3⇓G). Subcellular organelle fractionations of QPP-Myc 293T human fibroblasts using discontinuous gradients. 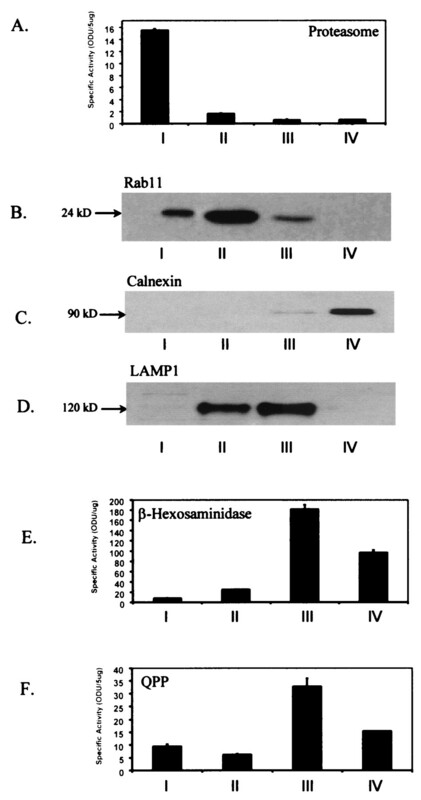 Four fractions were obtained and assayed for proteasome activity as a cytosolic marker (A), immunoblot analysis of the secretory vesicle marker Rab11 (B), immunoblot analysis of the ER marker calnexin (C), immunoblot analysis of the lysosome/late endosome marker LAMP1 (D), enzyme assay of lysosomal β-hexosaminidase activity (E), QPP enzymatic activity (F), and immunoblot analysis with an anti-Myc Ab (G). QPP was first isolated from Jurkat cells where it is constitutively expressed. Therefore, we also analyzed QPP distribution within these cells. Jurkat cells were lysed by Dounce homogenization, and organelle fractionation was performed as described above. The same cell fractionation was conducted on untransfected Jurkat cells (Fig. 4⇓). The proteasome activity localizes to the soluble fraction (I; Fig. 4⇓A), and the majority of Rab11 migrates in fraction II (Fig. 4⇓B), while calnexin localizes to the fraction IV (Fig. 4⇓C). As in the transfected fibroblasts, LAMP1 was highly enriched in fraction III, although some was also found on the less dense fraction II. Most of the β-hexosaminidase activity was found in fraction III (Fig. 4⇓, D and E). The presence of membrane-bound LAMP1 but low β-hexosaminidase activity in fraction II might indicate that a fraction of the lysosomes was broken during Dounce homogenization, causing the release of soluble proteins such as β-hexosaminidase and decreasing the density of the lysosomes. The majority of QPP Ala-Pro-AFC cleaving activity was found in fraction III (Fig. 4⇓F). These results suggest that QPP localizes to vesicles that are either part of the lysosomal compartment or to vesicles that have similar density to lysosomes. Subcellular organelle fractionation of untransfected CD26− Jurkat T cells. 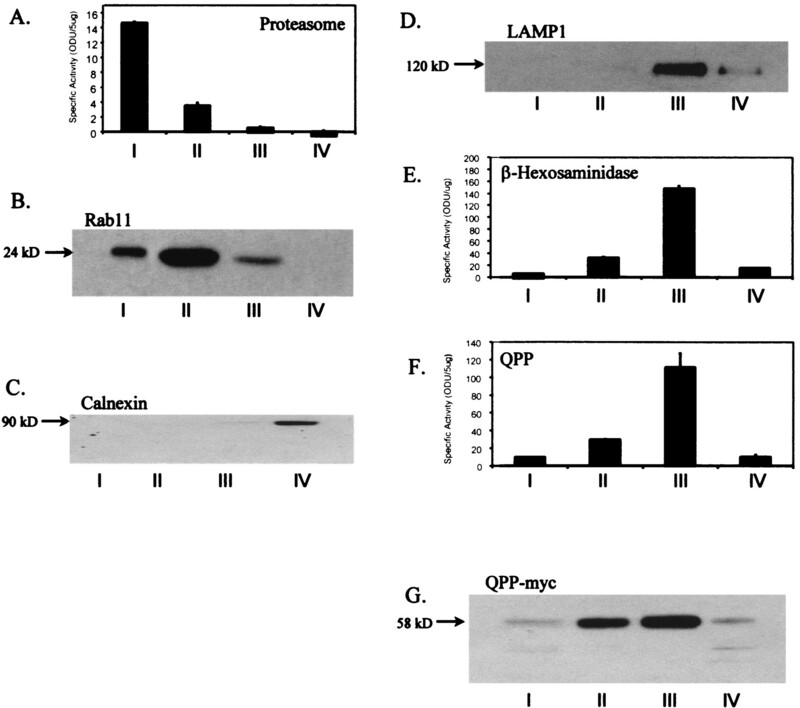 The fractions were analyzed for proteasome activity (A), Rab11 expression (B), expression of the ER marker calnexin (C), immunoblot analysis of LAMP1 (D), lysosomal β-hexosaminidase activity, and QPP enzymatic activity (F). To further define the localization of QPP within the lysosome-containing fraction (III), we performed colocalization experiments with QPP and the late endosomal and lysosomal marker, LAMP1 (21). 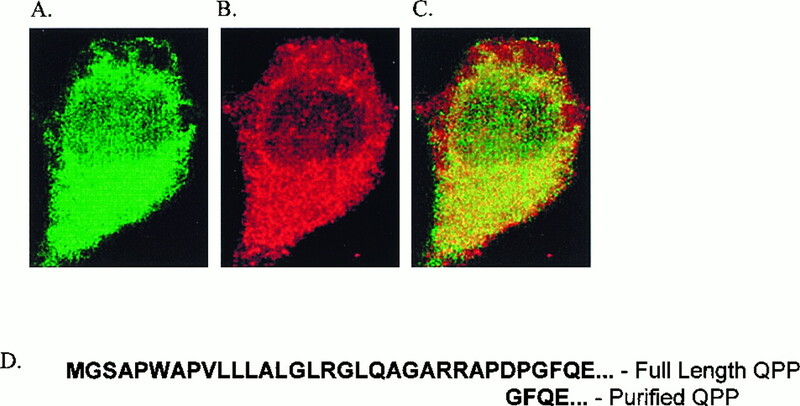 QPP-GFP and LAMP1 did not colocalize, as determined by confocal microscopy (Fig. 5⇓, A–C), suggesting that QPP is routed to alternate vesicles that migrate with the lysosomes under the discontinuous gradient fractionation conditions. QPP localizes to nonlysosomal vesicles. A, Confocal microscopy of QPP-GFP (green) fibroblasts. These cells were permeabilized and probed with the anti-LAMP1 (red) Ab (B) and a merged computer image (C) was made. D, Cellular fractionation of QPP-HA fibroblasts on a continuous density gradient. The gradient was prepared as described in Materials and Methods. Immunoblot analysis was performed of LAMP1, adaptin-α, QPP, and Rab 11, respectively. E, Analysis and comparison of QPP and β-hexosaminidase enzymatic activities in the various fractions. A higher resolution was obtained by performing continuous gradient separations. QPP-expressing fibroblasts were separated into 51 fractions and probed for the late endosomal and lysosomal marker, LAMP1, and QPP (Fig. 5⇑D). These fractions were also probed for adaptin-α, a component of adaptor protein 2 that is found in clathrin-coated vesicles from the plasma membrane (24, 25), and Rab11, a small GTP-binding protein that associates with the TGN, some secretory vesicles, and recycling endosomes (23). Fig. 5⇑D shows that the distribution pattern of QPP is different from that of LAMP1. Most QPP is found in relatively more dense vesicles, with its peak at fractions 45 and 47. The appearance of QPP in the least dense soluble fractions is presumably from ruptured vesicles, perhaps due to the increased centrifugation time required for this fractionation method. The LAMP1 expression pattern has two peaks: one at fraction 25, possibly representing the late endosomes, and the other at fraction 41, representing the lysosomes, according to the β-hexosaminidase marker (Fig. 5⇑E). The distribution pattern of Rab11 is significantly different from that of QPP, as it localizes to the less dense vesicles, in agreement with the data from the discontinuous gradients (Fig. 3⇑B). Adaptin-α also shows a different distribution than QPP, and their respective fractions of maximum expression are clearly different. Analyses of the fractions for QPP and β-hexosaminidase enzymatic activities show a distribution in accordance with the Western blot analysis (Fig. 5⇑E). The QPP activity reaches a maximum in fraction 47 and is slightly elevated in the first few fractions, where the soluble QPP would be found. The β-hexosaminidase enzymatic activity correlates with the Western blot profile of lysosomal LAMP1 distribution, with maximum activity at fraction 41 and low activity throughout the endosomal range. It should be noted that the elevated QPP activity in the least dense fractions has no corresponding increase in β-hexosaminidase activity, further supporting the idea that, while the intact QPP-containing vesicles and the lysosomes have similar densities, as was seen with the discontinuous gradients, they are not the same vesicles. Many lysosomal proteins, particularly lysosomal matrix proteins, are targeted to the lysosome through the M6P receptor pathway (13). To determine the effect of glycosylation on the localization of QPP, fibroblasts treated or untreated with tunicamycin were subjected to organelle purification using discontinuous gradients. As shown in Fig. 6⇓A, unglycosylated QPP was still found in the same fraction (III) and did not show increased accumulation in the Golgi apparatus. This shows that glycosylation and the M6P receptor pathway are not required for the routing of QPP, suggesting a nonlysosomal vesicular localization. However, M6P-independent localization of proteins to lysosomes has also been described (26). QPP localizes in an M6P-independent manner and is found within the vesicles. A, QPP-Myc transfected fibroblasts were treated with tunicamycin (5 μg/ml) for 24 h and then subjected to organelle fractionation using discontinuous gradients. The four fractions were analyzed by anti-Myc immunoblot analysis. B, Proteinase K treatment of QPP-containing vesicles. Fibroblasts transfected with QPP-HA were subjected to organelle fractionation. 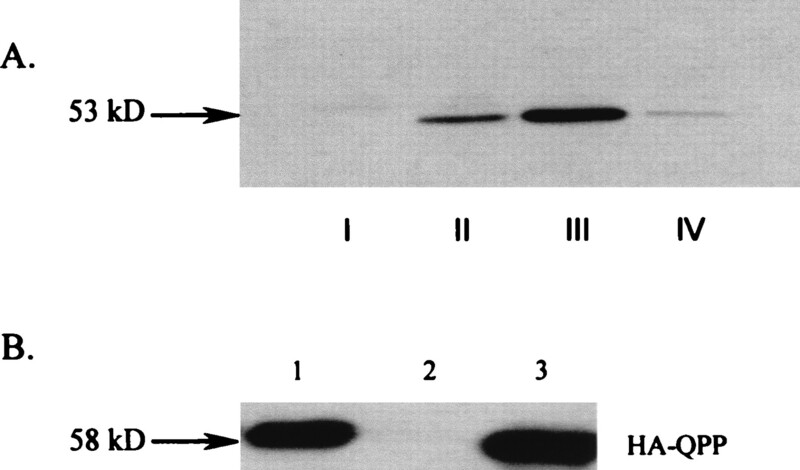 The fraction containing lysosomes and QPP-expressing vesicles (III) was 1) left untreated, 2) treated with Triton X and proteinase K, or 3) treated with proteinase K alone. These fractions were analyzed using the anti-HA Ab. 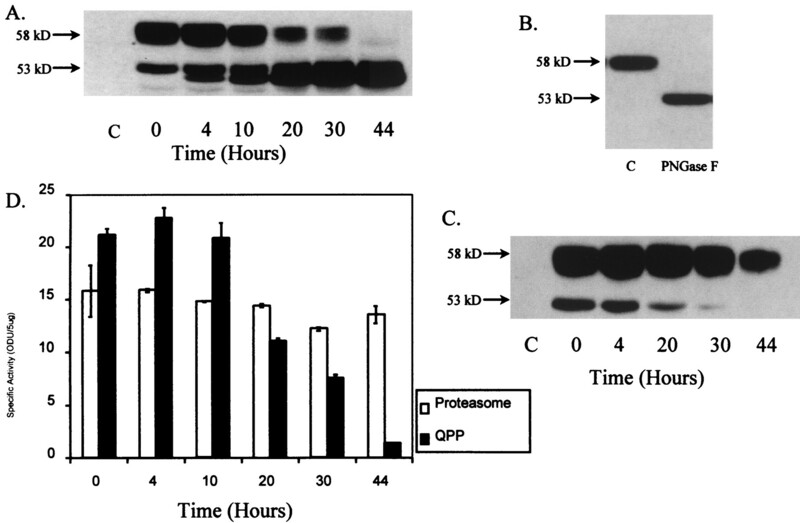 To confirm that QPP is located within vesicles, QPP-HA fibroblasts were fractionated using discontinuous gradients, and intact vesicles from fraction III were treated with proteinase K. This fraction contained lysosomes/late endosomes and QPP-containing vesicles (Fig. 6⇑B, lane 1). When the intact vesicles were first permeabilized with detergent and then treated with proteinase K, QPP was degraded (Fig. 6⇑B, lane 2). However, in the absence of detergent, no degradation of QPP by proteinase K was seen (Fig. 6⇑B, lane 3), indicating that QPP is located on the inside of the vesicles. Given that QPP localizes to a post-Golgi vesicular fraction distinct from lysosomes, we analyzed the secretion behavior of QPP. To determine whether QPP is secreted, we tested the supernatants of QPP-transfected fibroblasts and vector-transfected fibroblasts for QPP and observed that QPP was secreted in a functionally active form (data not shown). Calcium-dependent exocytosis is a well described phenomenon (27, 28). QPP release from Jurkat cells was monitored after the addition of the calcium ionophore, ionomycin. Jurkat cells in PBS with 1 mM CaCl2 were treated with ionomycin for 15 min at 37°C, and QPP activity in the supernatant was measured. As Fig. 7⇓ shows, ionomycin treatment of Jurkat cells caused increased the secretion of QPP. As a control for lysed cells, the activity of the cytosolic proteasome complex was measured in the supernatant. The proteasome activity remained similar for both cell populations. These results suggest that QPP secretion can be triggered by calcium mobilization. QPP secretion is regulated in Jurkat cells. Jurkat cells in PBS with 1 mM CaCl2 were treated with either PBS or 10 μM ionomycin for 15 min at 37°C. The supernatant was then analyzed for QPP activity (▪). The amount of enzyme released is expressed as a percentage of the total activity in the cells. As a control the chymotrypsin activity of the proteasome complex was analyzed (□). A large number of signal proteins from diverse families such as cytokines, chemokines, and neuropeptides show a remarkable conservation of an X-Pro motif on the N-terminus (4). Over the last few years, it has become apparent that a number of these signal peptides are shorn of their X-Pro motifs by CD26/DPPIV with profound consequences to their biological function. These include the chemokines RANTES, SDF1, MDC, and eotaxin (2, 3, 5, 6). The ubiquity of the X-Pro motif on signal molecules suggests that this motif may be part of an important post-translational regulatory mechanism in a variety of signal pathways in multiple tissues. Although there are many potential substrates with N-terminal X-Pro motifs, few known enzymes have the requisite substrate specificity to cleave these motifs (4). Until recently, only the cell surface molecule CD26/DPPIV was known to have the correct substrate specificity at physiologic pH to be able to cleave the X-Pro motif from these molecules. Like CD26/DPPIV, QPP cleaves N-terminal dipeptides when the penultimate amino acid is a proline and, to a lesser extent, an alanine (4, 9, 10, 11). The discovery of a CD26/DPPIV-like activity intracellularly expands the potential realm of post-proline-cleavage and regulation. QPP was initially isolated and cloned from Jurkat T cells (9). Although functionally homologous to CD26/DPPIV, QPP bears no sequence homology with the former enzyme. It does, however, share homology with the carboxypeptidase, PCP (7, 9). Similarly to CD26/DPPIV and PCP, QPP is targeted to the ER, undergoes cleavage of a propeptide, and is N-glycosylated. The glycosylation of QPP is necessary for its enzymatic activity, either to assume its native three-dimensional conformation or for substrate binding. However, the absence of glycosylation does not perturb the intracellular localization of QPP. While many of the reported experiments were conducted on QPP-transfected fibroblasts, overexpressing of QPP did not alter the phenotype or growth characteristics of the cells. Unlike CD26/DPPIV, QPP does not localize to the cell surface, but to intracellular vesicles distinct from the TGN. This was confirmed by the fact that surface biotinylation did not yield any biotinylated QPP molecules, as tested biochemically with immunoprecipitations (our unpublished observations). In a discontinuous gradient, QPP-containing vesicles comigrated with the lysosomes; however, in a continuos gradient we were able to show that QPP has a different distribution from the lysosomal marker LAMP1. QPP-containing vesicles are downstream from the TGN and are distinct from Rab11-containing vesicles and clathrin-coated endocytic vesicles. Interestingly, QPP-containing vesicles have a similar density as lysosomes, but under more stringent fractionation can be seen to be more dense than lysosomes. Also, as seen with confocal microscopy analysis, QPP does not colocalize with LAMP1, and unlike most soluble lysosomal proteins, QPP localizes in a M6P-independent manner. However, a glycosylation-independent mechanism of routing to lysosomes has also been described in the literature (26). Within its vesicular compartment, QPP may come into contact with substrate molecules that are in the process of being synthesized or secreted. QPP does not appear to localize to clathrin-coated endocytic vesicles, but this does not rule out contact with endocytosed substrate molecules. Calcium-dependent exocytosis of vesicular proteins is a well-described phenomenon (27, 28, 29). QPP secretion occurs via a calcium-dependent mechanism and can be induced by the calcium ionophore ionomycin, although secreted QPP represents only a minor part of the total QPP activity. Preliminary experiments indicate that QPP is also secreted in response to TCR-mediated signaling (H. Lee et al., manuscript in preparation). Such secretion behavior would allow the cell to release the aminodipeptidase activity in response to stimulation. Given that extracellular signal molecules play a pivotal role during cellular activation, the release of aminodipeptidase activity may play an important modulatory role. It remains to be seen whether QPP and CD26/DPPIV work in concert or through distinct pathways. We recently found that highly specific inhibitors of post-proline-cleaving aminodipeptidases trigger a caspase-dependent apoptotic pathway in quiescent lymphocytes, but not activated lymphocytes (12). These results reinforce the idea that post-proline-cleaving aminodipeptidases play an important role in lymphocyte homeostasis. Interestingly, the target of these inhibitors appeared to be QPP rather than CD26/DPPIV, indicating that there may be some separation of function between these two enzymes that share substrate specificity, but have distinct subcellular localizations. Although QPP was isolated from lymphocytes, Northern blot analysis indicates that QPP is expressed in multiple tissues (M. Chiravuri et al., unpublished observations), suggesting a diverse role for this gene product. Post-prolyl aminodipeptidase-mediated post-translational regulation of signal molecules has been a rapidly expanding field of study in the last few years. The discovery of alternate CD26/DPPIV-like activities in distinct subcellular locations contributes to the understanding of what appears to be a complex regulatory mechanism at the post-translational level. We thank Dr. J. Fred Dice for helpful discussions and support. We also thank Nicole D’Avirro, Shurjo Sen, and Sreya Urs for critical reading of the manuscript. ↵1 This work was supported by National Institutes of Health Research Grants AI36696 and AI43469 (to B.T.H.). ↵3 Abbreviations used in this paper: SDF, stroma-derived factor; QPP, quiescent cell proline dipeptidase; DPPIV, dipeptidyl peptidase IV; DPPII, dipeptidyl peptidase II; PCP, prolylcarboxypeptidase; GFP, green fluorescent protein; M6P, mannose-6-phosphate; LAMP1, lysosome-associated membrane protein-1; MDC, macrophage-derived chemokine, TGN, trans-Golgi network; zGGL-AMC, z-glycine-glycine-leucine-aminomethylcoumarin; Ala-Pro-AFC, alanine-proline-aminofluorocoumarin; HA, hemagglutinin; PNS, postnuclear supernatant; ER, endoplasmic reticulum; GlcNAc, N-acetylglucosamine; PNGase F, peptide-N-glycosidase F.
Dice, F. J.. 1999. Lysosomal Pathways of Protein Degradation Landes Bioscience, Georgetown, TX.